Stickers have been around for literally centuries. 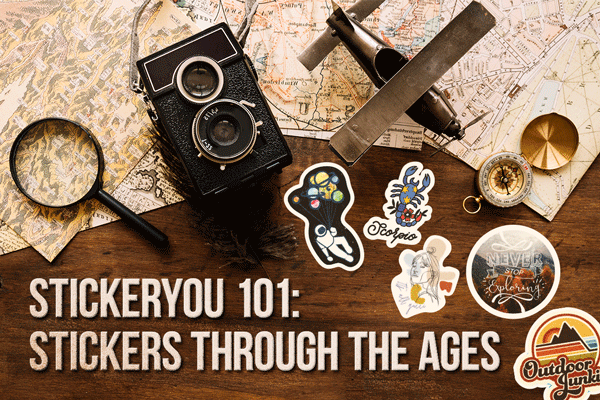 Here’s an in-depth look at the history of the humble sticker, from its roots in ancient Egyptian markets to the sticker art craze of the 90s and 2000s. 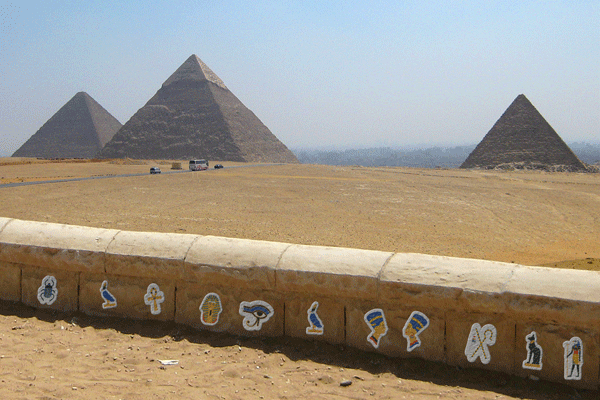 Stickers first appeared in ancient Egypt, almost 30 centuries ago. No seriously, archaeologists have found actual advertisements for sales and goods plastered on the walls of ancient Egyptian marketplaces with a wheat-based paste. Fast forward to the 1700s, and revenue and tax stamps were being applied to products and documents with a glue paste. Meanwhile in France, the artist Simon Ravenet was creating décalquer (or, decalomania), a technique that entailed pressing tissue paper in between colored copper plates and then transferring the designs on that paper to either porcelain or ceramic surfaces. This is, of course, how the word “decal” was coined, and it is still a process that artists use to this day. In 1840, a UK item that cost one penny changed stickers forever: the postage stamp. Sir Rowland Hill reformed the UK’s postal service and introduced the world to the Penny Black stamp. The postage stamp had an adhesive backing that was activated when moistened before being affixed. By the 1880s, the process of lithographic printing became much easier and cheaper, and more colors were available to print. This made it much more convenient for everyone with something to sell to make creative advertisements for their products. The problem was making these advertisements stick to the surfaces of boxes or products that were destined to travel long distances and be subject to temperature changes before being sold. When refrigerated train cars were introduced for transporting food and produce across continents and borders, farmers, producers and manufacturers needed a surefire way to easily identify products in boxes and to prevent labels from peeling off the sides of packages in fluctuating temperatures. Thus, a gummy adhesive was added to lithographic labels, and these labels began showing up on fruit crates, soap boxes, pill bottles, and packages of cigars and cigarettes. In 1935 American inventor R. Stanton Avery, aka the father of modern stickers, combined machine parts, a saber saw, and a slew of printing materials to create a pressure-sensitive machine that could make self-adhesive labels with peel-off backings that could be die-cut into any size or shape. The sticker as we know it today, was born. 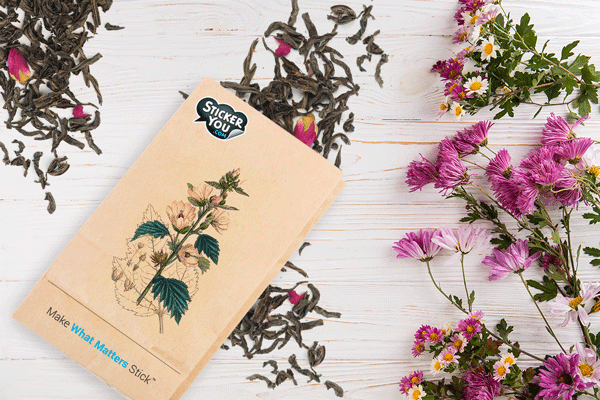 After Avery introduced the general public to the many applications self-adhesive stickers through his company Avery Dennison, the popularity of stickers skyrocketed. In the 1940s a printer named Forest Gill combined self-adhesive labels and day-glow paint to create a replacement for the ubiquitous, opinionated "bumper signs" that people attached to car bumpers with bits of twine. 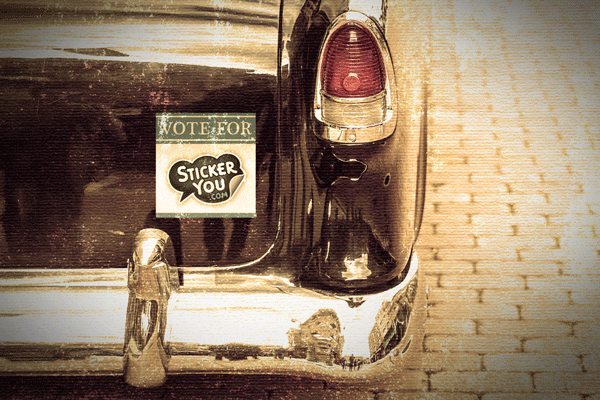 By the 1960s, bumper stickers could be seen on vehicles on every major highway all over North America. 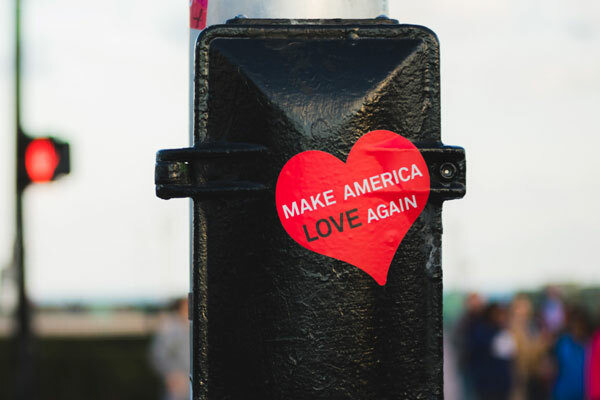 The advent and subsequent popularity of bumper stickers led to people picking up on the idea that stickers could be fun as well as informative. By the 1960s, stickers were being included with packs of trading cards, in boxes of candy, and at souvenir shops worldwide. In the late 60s and early 70s things got pungent for sticker production with the invention of the scratch n’ sniff sticker. Before photocopiers were around, documents were copied via a piece of paper inserted between sheets of carbon paper (hence the term “carbon copy”). Scientists, annoyed with this messy process, decided to figure out a way to avoid using carbon paper. During this process, someone at the science and technology company 3M developed a method of micro-encapsulation, which could also be used to hold scents in the ink itself. 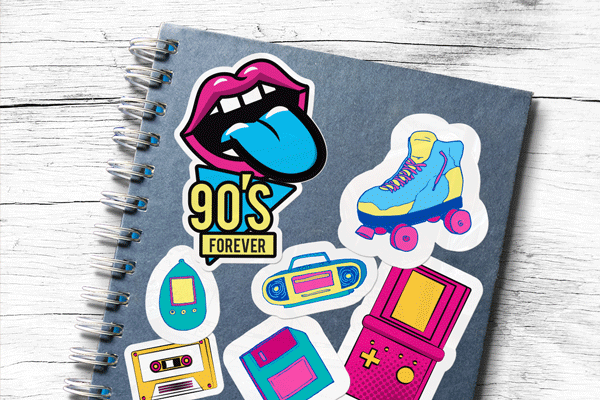 By the 1990s the sticker craze was in full swing. Stickers could now be smelly, fuzzy, puffy, scaly, perforated, and some could even glow in the dark. Stickers were used as promotional items for TV Shows, musicians, movies, and toys. People collected stickers in books, put them on luggage, walls, cars, clothes and everything in between. Artists began creating stickers and slapping them on walls and underpasses in urban centers, and sticker art became a part of street art culture. Stickers today are still extremely popular and are a lucrative business. The global label market alone is expected to hit over 41 billion dollars in 2019. The ease of e-comm and tech means many businesses purchase stickers printed through specialty printers as opposed to producing them in-house. Barcode stickers make it easier for retailers to sell and organize consumer goods. These evolved into QR code stickers which can now seamlessly integrate with augmented reality. Researchers are now experimenting with smart labels, or Radio Frequency Identification (RFID) labels, which use electromagnetic fields and radio frequencies to store and transfer data at rapid speeds. RFID tags make it possible to track every product in a store, and may make check outs a thing of the past. Many product labels are now tamper-evident, which allows you to physically see when packages have been opened or meddled with, and stickers are now often used to impart crucial product and safety knowledge. For example, Canada’s EnerGuide uses labels for large appliances that lets consumers know how much energy a machine uses and how the usage compares to other models. Stickers are also found all over the art and fashion world and have become collectible items for some brands. What does the future hold for stickers? Will we see eco-driven developments that cut down on waste? Will we see further integration of stickers and tech in incredible and useful ways? It may be too soon to tell. But whatever the future holds, at StickerYou we strongly believe that people will continue to use stickers to make what matters stick.